Faeries are notoriously difficult to define; the precise nature of their existence being seemingly impossible for mortal minds to comprehend. There are several popular theories to explain the essence of these obfuscated entities, each based on their own belief systems and encumbered by the accompanying dogma thereof. And while our ancient ancestors may have lived closer with the Good Neighbors than do we, perhaps there are modern analogues to which we are privy that might represent the same mystery. Wiccans and other pagan sects are known to equate faeries with nature spirits; they hold nature in high regard, and have strong ties to traditional knowledge. It's never been unusual to associate faeries with a particular natural object or location--interesting rock formations, hills, and bodies of water, for instance--but this belief places faeries even further into the realm of nature by defining some of them as expressions of the natural objects themselves. Gnomes, an amalgamation of Nisse, Tomte, and Dwarfs, were said by Paracelsus to be earth elementals, and Pixies are often associated with certain plants, like foxglove, or rings of mushrooms. There's no denying the association between faeries and the natural world, which is well-established, but one must consider the origin of the stories that show these connections. In the agrarian societies so prevalent until little over a century ago, the natural world played a prevalent role in people's lives and the average person lived much closer to nature. Nature itself was dangerous and untamed; it was given a significance and authority that few in developed parts of the world feel today. And given the reverence paid to nature, it would make sense to feel as though any unexplained event one encountered in the wild must be in some way tied to the power of the natural world. A chance encounter with a strange creature in the woods would certainly take on a special significance under these circumstances, and a correlation between the creature and its location might be formed. Similarly, animal husbandry and growing crops were necessary for survival, and these important aspects of our ancestors' lives were closely tied to their interactions with faeries. There could be fewer more helpful acts than aiding in a harvest or feeding livestock, nor could there be many more harmful than destroying the same. But the behavior of Nisse and Brownies wasn't due to their affinity for farm work so much as their adherence to the particular rules through which they interacted with humanity, and the actions of faeries on farmsteads always had more to do with people than plants and animals. In no aspect of faerie lore is the connection between humans and faeries more prevalent than in the theory that the Fair Folk are spirits of the dead. Nisse and Tomte are said by some to be patriarchal revenants risen during certain times of year--like Yule--to visit their descendants and aid them in tending the family farm. Dwarfs are also closely associated with the afterlife, and sometimes act as guardians of the underworld. Faeries of all stripes are rumored to dwell in and near burial sites and ancient prehistoric forts--haunted barrows and faerie hills often go hand-in-hand. Even a popular retelling of the legend behind the faerie song Paddy's Rambles through the Park has the titular tune first heard in a cemetery. Correlating faeries and ghosts seems natural enough, although one should always be wary of explaining one mystery with another. Still, the reported behavior of faeries, especially those said to dwell in the home, is strongly similar to ghosts, and poltergeist effects are often reported alongside both. An angry Boggart, for instance, can cause items to fly off of the shelf, and will travel with a family if they try and move away--just as some hauntings are said to do. The resemblance between the two phenomena--faeries and hauntings--is disconcerting, and one can hardly be blamed for believing that there may be a root phenomenon at least partially responsible. But there is another aspect of the unexplained that also deserves mention, one that has enough similarity with both faeries and hauntings to warrant comparison--UFOs and extraterrestrial encounters. Almost every subcategory of ufology has an analogue in faerie folklore. Strange lights seen at night were once called will-o'-the-wisps, and the lonely hills and barrows where they were often witnessed might today be called window areas. Circles of flattened plants found in fields used to be called elf circles, but have been renamed crop circles in the modern era. Faeries had an interest in human reproduction, and were known to steal babies away to replenish their own thinning stock--just as today some extraterrestrials are said to perform hybridization experiments to save their own doomed species. Faeries and extraterrestrials both are often active at night, and love to visit humans as they sleep--the Sidhe are said to abduct people from their beds, just as grey aliens are accused of doing. But neither is limited to bedroom visitation, and both faeries and extraterrestrials accost travelers caught unawares. Consider the following scenario: a person is out walking along a lonely country road when they see strange lights in the distance, they are then approached by short beings who take them away to an otherworldly environment, eventually returning them to roughly the spot they were taken, and the unfortunate victim is later startled to discover that far more time has passed than they thought possible. Is this an encounter with faeries or extraterrestrials? 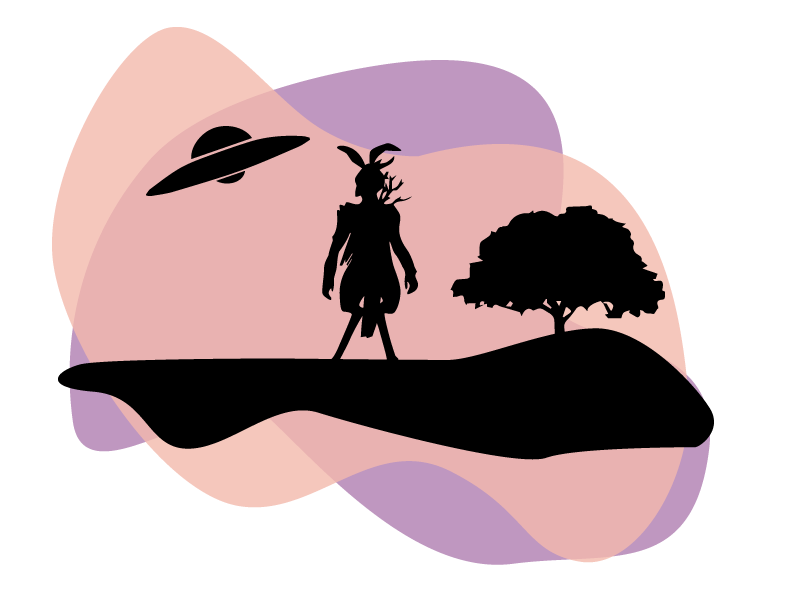 Reported interactions with faeries and extraterrestrials often contain one or more of these listed elements, and while some superficial details--the beings' appearance, method of travel, etc--might differ, the overarching narrative is the same. Stories of faeries, extraterrestrials, and certain hauntings are simply bits of mythology that all arose out of the same inborn human archetypes. Stories of faeries are a misinterpretation of encounters with extraterrestrials. Stories of extraterrestrials are a product of faerie glamour. Extraterrestrials, faeries, and even some hauntings, are all facets of a singular phenomenon that has existed alongside humanity for at least as long as written history. Number one discounts the evidence we have for the unexplained phenomena referenced, including well-documented UFO and abduction reports, and the claims of eyewitnesses who say they still see faeries today; and numbers two and three are opposite sides of the same coin, with no definitive proof to support either. Which leaves us with number four, perhaps the strongest possibility, and therefore the best place to start if we're to begin to understand this phenomenon. A phenomenon that we seem to be no closer to understanding than we were at its advent in our far distant past; a phenomenon that is not only unknown, but might itself be unknowable, as we are unable to properly perceive it.